William Morris' use of birds and animals in his early tapestries is a forebear to his later carpet patterns. This design, one of his most successful compositions, uses a dense cover of trailing acanthus leaves, as seen in his first tapestry 'Acanthus and Vine', into which have been placed Philip Webb's five studies of animals and birds. It is possible that Henry Dearle supplied foreground floral details, although these are similar to Webb's preparatory drawings. The verse was later published under the title 'The Lion' in Morris's Poems By the Way. The tapestry was woven by Morris & Co.'s three most senior weavers 'under the superintendence of William Morris' according to the 1890 Arts and Crafts Exhibition catalogue. Bought by Aleco Ionides for 1 Holland Park, in London, it hung in the study together with an acanthus-leaf panel. 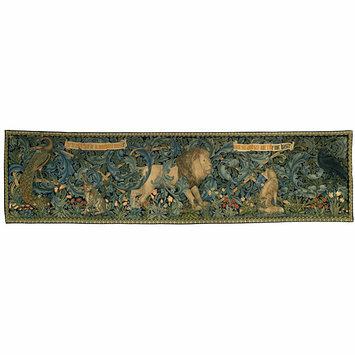 Tapestry depicting birds, animals and flowers within a dense cover of trailing acanthus leaves with an embroidered inscription. It is probable that the acanthus depicted in the tapestry was designed by William Morris, animals by Philip Webb and foreground floral details by Henry Dearle. The Forest Tapestry was woven at Morris' tapestry works, Merton Abbey, in 1887. With its elaborately filigreed patterning and sumptuous detail, the tapestry is a superb example of Morris' revivial of the craftsmanly richness and precision of medieval art. It was acquired from the artist by Aleco Ionides of 1 Holland Park from whose heirs the museum purchased it in 1926. The Forest, tapestry woven wool and silk on a cotton warp, designed by William Morris, Philip Webb and John Henry Dearle, woven at Merton Abbey by William Knight, John Martin and William Sleath, 1887. Karen Livingstone and Linda Parry, eds., International Arts & Crafts (V&A: V&A Publications, 2005), p.16.